Spencer Howard fell just four pitches shy of a "Maddux." But maybe someday, a pitcher will duplicate the right-hander's performance Friday and it'll be called a "Howard." The Phillies' No. 18 prospect threw the first postseason no-hitter in team history as Lakewood advanced to the South Atlantic League Championship Series with a 1-0 blanking of Kannapolis at FirstEnergy Park. 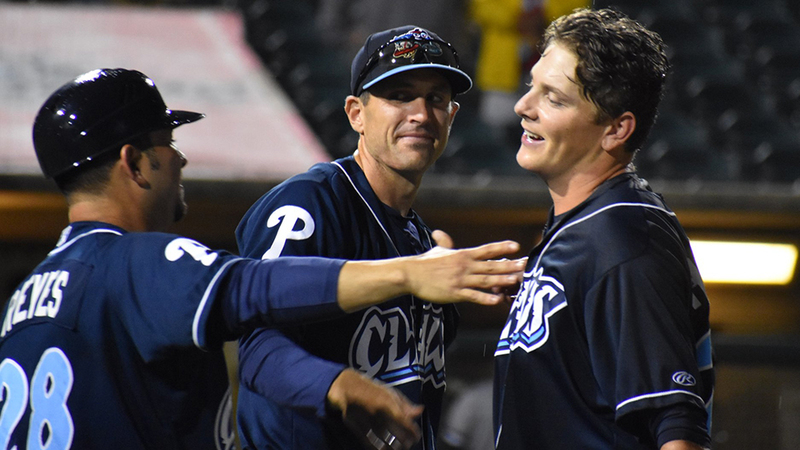 He fanned nine as the BlueClaws swept the best-of-3 semifinals. And unlike most hurlers, Howard knew the no-hitter was unfolding. "Oh, anybody who says that is a complete liar," he said. "I think the first time I realized it was going out in the seventh inning. I was like, 'Wow, just let them put the ball in play.'" Howard needed only 103 pitches -- a complete-game shutout on 99 pitches or fewer is known as a Maddux -- throwing 73 strikes. The 6-foot-3 right-hander had a pitch working for him that was more a pitch-in-progress during the regular season. "Tonight was the most confident I've felt in my curveball all year," he said. "I worked on it extensively for the entirety of the year. But this was the first time in a game setting that it was this controlled. "In college, I didn't really have it and last season I worked on a spike curve. The movement was there, but I didn't really know how to throw it or compete with it. I played off the high fastball with it and I threw a couple in the dirt that were chase pitches." The no-hitter was the first for Lakewood since Nick Fanti turned the trick on July 17, 2017 against Charleston. Howard (1-0) had four scoreless starts during the season, each time going six innings. The 2017 second-round pick was 9-8 with a 3.78 ERA and 147 strikeouts, tying for the SAL lead with Greenville's Jhonathan Diaz and Columbia's Tony Dibrell. Kannapolis' Parker Rigler (0-1) matched Howard before the BlueClaws broke through in the sixth. Jose Antequera singled with one out, moved to second on a groundout and scored on a base hit to left by Phillies No. 30 prospect Simon Muzziotti. It was clear from the start that Howard, a product of Cal Poly San Luis Obispo, had the strikeout pitch working as he fanned four of the first six batters. He ran into trouble in the third, however, thanks to two errors. Michael Hickman ended any thoughts of a perfect game by reaching on a miscue by first baseman Jake Scheiner. Howard threw a wild pitch and issued his lone walk to Tyler Frost. Another error by shortstop Nick Maton loaded the bases, but Howard got 12th-ranked White Sox prospect Steele Walker to line to third and end the threat. Howard retired seven in a row until he plunked Frost leading off the sixth, then retired the final 11 Intimidators to finish the masterpiece. "Obviously, it's exciting," Howard said. "It gives us momentum going into the next series and, hopefully, it'll help us come away with a ring." The BlueClaws will play Lexington in the South Atlantic League Championship Series, beginning Monday.